"A Most Wanted Man" is a slow-burn espionage drama about people playing chess and others merely playing checkers. Set in Germany, John Le Carre's book unfolds on film via director Anton Corbijn ("The American"). Mr. LeCarre's cold, bleak and unforgiving worlds typically feature a solitary male figure who wears dread for a uniform and calculates and anguishes between drinks and cigarettes. 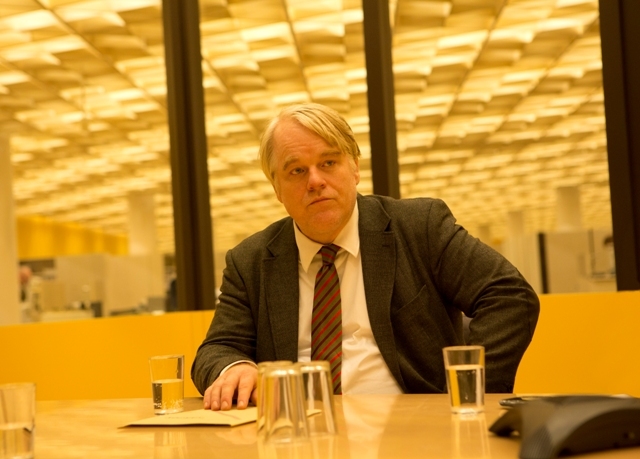 That man is Gunther (an excellent Philip Seymour Hoffman), a failed German intelligence operative from what was left of the Stasi days. Now, post 9-11-01, Gunther operates in Hamburg heading a modified anti-terrorism unit. Gunther has the inside track on a tortured Chechen-Russian Islamist fugitive Issa (Grigoriy Dobrygin), who claims entitlement to his father's money. Yet Issa is suspected as a link to a terror plot. Gunther, who's seen it all in a long career, and doesn't shirk doggedness, has to face down a demanding German intelligence officer who has been pressing him to give Issa up, and a CIA investigator (Robin Wright), who seeks cooperation with Gunther. All the while Issa fights arrest and possible deportation, while his lawyer Annabel (an unrecognizable Rachel McAdams, at least to me) tries to keep him safe. Written by Andrew Bovell, "A Most Wanted Man" is methodical, intelligent and taut, though a few scenes between Annabel and Issa stray or go limp. Each scene shows not only surveillance but more crucially the suggestion of it. A continuous cat-and-mouse game is played in a maze of brinksmanship. It's survival of the stealthiest. Mr. Corbijn springs mousetraps. The production design and Benoit Delhomme's lingering, extra camera angles prolong the atmosphere of agony. The director's slow, cerebral roller-coaster ride stops abruptly ten steps short, yanking its welcome mat out from under your feet. Mr. Bovell uses Mr. le Carre's carefully-detailed book characters well. Instinctively they are figures you can't afford to trust. Exhibits A through C: A banker, a philanthropist (who may have links to Middle East terror groups) and the aforementioned lawyer. Fittingly, Mr. Corbijn's spy drama never embraces warmth, and doesn't trust comfort or safety. Relationship scenes play out insincerely, lacking sturdiness. Bachelor Gunther has a brief, makeshift kissing session with a fellow employee for operative motives. Warmth and intimacy in le Carre's world equals weakness, and emotions have layers and a silent tragedy of their own. Characters long for security and love but know it will never come. Pain is solace in the spy game and opportunity and vice become best friends. It's obvious that characters in "A Most Wanted Man" are all self-interested barterers without regard for any consequences beyond those ends. Allegiance is superficial at best. The hunt is hollow. Betrayal is the bait. The divine pleasure of "A Most Wanted Man", aside from Mr. Hoffman's wonderful, all-consuming and world-weary performance, is its mood. This icy film begins in a sewer, and, naturally, everything flowing from it will be impure. Unclean hands are as guaranteed as death and taxes. Comfort and cleanliness is for the naive. The film's style is arresting: eye-catching and seductive, and brutally spare. I was riveted to my seat for much of it. "A Most Wanted Man" rivets you to its sense of awareness, psychology and art of compromising (in a destabilizing way) and inter-agency dealmaking. Mr. Hoffman is a wonder to watch, and his mannerisms fit an anguished, lonely character perfectly. Yet again, in this, his last complete performance he affectionately finds ways to put the most personal things about himself, demons included, on screen to benefit and enhance Gunther and by extension Mr. Corbijn's film. Gunther feels like Mr. Hoffman's most personal creation. The late actor's excellent work here deserved a better overall film to complement him, at least in narrative consistency. Some of the characters behave in ways you have trouble suspending disbelief for. Otherwise, "A Most Wanted Man" captures well a cruel, thankless world of espionage and intelligence, where words waft in the wind and victory is defined by the fewest defeats you can abide. With: Willem Dafoe, Homayoun Ershadi, Rainer Bock, Nina Hoss, Mehdi Dehbi, Derya Alabora, Daniel Bruhl, Kostja Ullmann, Vicky Kreps, Herbert Gronemeyer. "A Most Wanted Man" is rated R by the Motion Picture Association Of America for language. The film's running time is two hours and one minute.